Based on the string-theory, bikini, that is (and, therefore, wonderfully adjustable to many sizes), the Condom Bra is made in 2 pieces. Each cup is a triangle, knit from the topmost point down towards the fullest part of the breast and then gently shaped as work continues to the bottom edge underneath the breast. That edge is finished with a row of eyelet through which are laced the I-cords, tying it all together. Finished Measurements: 10” high and 13” at widest point of breast, 9" bottom edge (side "seam" to center front). NOTE: It’s easy to add length/width to accommodate your own lovely breast. The basic roadmap of this design will get you there. Go for it! of cup, cast on 5 sts. Next 3 rows: K2, yo, k across. Next row (RS): K2, yo, k across. Next row (WS): K2, yo, purl to last 2 sts, k2. Repeat last 2 rows until your work is as wide as you want your cup/triangle to be. For the sample I made, it was 60 sts or 13". Begin shaping: Count the number of sts and divide evenly by 3 and put markers between sections. I had 20 sts in each section. If you have any odd stitches, put them in the center section. Shaping row (RS): K2, yo, k2tog, k to marker, slip marker (sm); ssk, k to 2 sts before next marker, k2tog, sm; knit to last 4 sts, ssk, yo, k2. Next row (WS): K2, purl to last 2 sts, k2. Repeat last 2 rows until the center section disappears. In the sample, there were 40 sts remaining and the cup measured 9". Next row (RS): Work in pattern as established, but without center decreases. Eyelet row (RS): K1, (yo, k2tog) to last st, k1. Pocket: Pocket is made in the same manner as the cup/triangle, with the starting point at the bottom. When work reaches desired depth (approx. 20 rows). Next row (RS): Work a row of eyelets as on cup. I-cords: Measure from side “seam” to center front of bottom edge of bra. Make 2 I-cords this length plus approx. 4" for tying at center front. Use crochet hook to weave these cords into the garment through the eyelet rows. Secure the front/bottom edge I-cords to the side “seam” with several tack sts. Measure from nape of neck down the front/outer edge of the breast/cup to bottom/cast off edge then to center of back. Make two I-cords this length plus 10" for tying. Weave them in. It is not necessary to sew these cords into place (unless you so choose to specifically position the cups). Lace it up, tuck a condom in the pocket and hit the town! chain stitch cord is looped through your bra (or other!) strap, the pouch is fed through that loop, tightened up and tucked decoratively into the cleavage (or, left hanging out of it, swinging like a pendulum between 3 o’clock and 9, no matter the time zone). I like to wear mine with pearls. Cast on 19sts (I used long-tail method for a crisp edge). 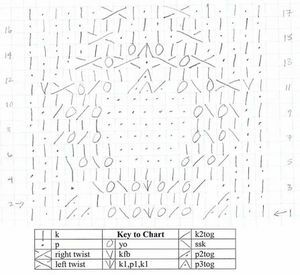 Rows 1-3: Work in Seed Stitch. Rows 4-20: Work the modified Sun Spot Lace decorative "flap" from the chart. Rows 21-22: Work in Reverse Stockinette Stitch (the purl bumps on the RS of the piece in effect "score" the piece so that it folds nicely along that line). Rows 23-48: Work in Seed Stitch. Rows 49-50: Work in Reverse Stockinette Stitch (creating another fold line). Rows 51-75: Work in Seed Stitch. Bind off row (RS): Bind off 9 sts. 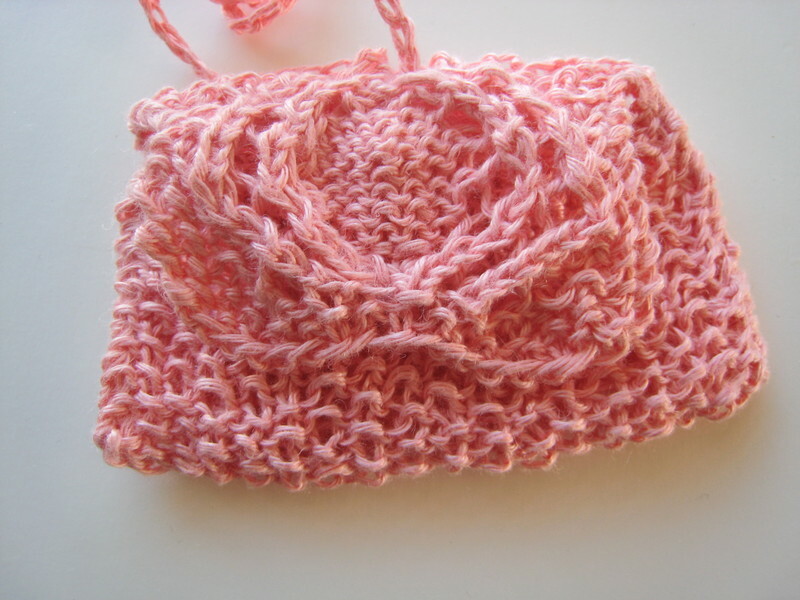 Switch to crochet hook and chain 90sts (or as many for desired length of cord when it is looped). Pull a long length of yarn (approx. 2 yds) from the ball and cut the yarn. 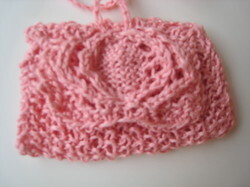 Using the crochet hook, pull the chain from inside to the outside (frontside) of the work through the right-of-center eyelet formed by the lacework on Row 14. Then pull the chain back to the inside of the work through the left-of-center eyelet. Continue binding off remaining sts. 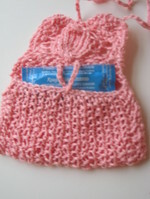 FINISHING: Sew up the sides of the pouch and weave in any loose ends. Strap it on, load the boat with life preservers and make like a Boy (or Girl) Scout!